13th Apr: Hindustani Classical Concert! We are announcing the best musical feast of the year: ”Vidushi Smt. 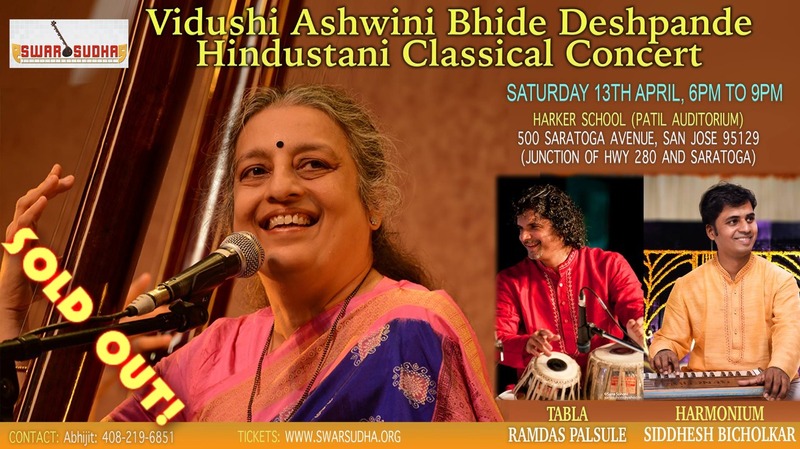 Ashwini Bhide Hindustani Classical Concert”. Vidushi Smt. 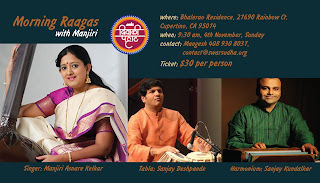 Ashwini Bhide Deshpande is blessing us with a performance in USA after years, so this is a rare opportunity. She'll be accompanied by the talented and versatile duo of Pandit Ramdas Palsule on the Tabla and Siddhesh Bicholkar on the harmonium. Experience the magic of hearing her sing in in our very own new top notch "Patil Theatre" in Harker School. Equipped with the latest acoustic technology and wonderful seating the experience of listening to Hindustani Classical Music in this state of the art auditorium is going to be unique and unforgettable. Here are more details on these World Class Artists! An outstanding vocalist of the famed “Jaipur-Atrauli” Khayal Gayaki tradition. She represents the new generation of veterans, worthy of wearing the mantle of the old masters. Her musicianship is characterised by a blend of tonal sweetness coupled with vitality and emotion and raga structure-architecture. Although a classicist by temperament and training, She's equally at ease with lighter varieties like Thumri - Dadra and Bhajans. She has traveled extensively all over the globe participating in various prestigious music conferences and Sangeet Sammelans. Her live concerts have been acclaimed for their sheer presentation delight, and the aesthetic and musical quality. A 'top grade' artiste of Akashwani and Doordarshan, she has featured in several national programs and AIR Sangeet Sammelans. Her contribution to Hindustani classical vocal music has been acknowledged by many prestigious awards and citations. In June 2015, she was declared the recipient of the Sangeet Natak Akademy Award. She was the first female Hindustani vocalist to have been decorated with the prestigious Rashtriya Kumar Gandharva Samman. A familiar name to lovers of Hindustani music as an intellectual Tabla Player who has carved a niche for himself at a very young age. Ramdas is one of the most senior disciples of World Famous Tabla Maestro Taalyogi Pandit Suresh Talwalkar. Vidushi Smt. Malini Rajurkar, Late Vidushi Smt. Veena Sahasrabuddhe & many more. 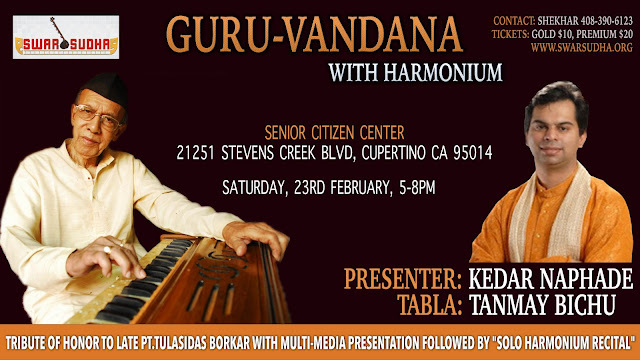 to receive guidance from Pandit Tulsidas Borkar, renowned Harmonium exponent and Guru. Siddesh is also a well known “Jal-Tarang” artist and has received numerous awards and recognitions all over the world for his amazing contribution to music. Swarsudha proudly announces its first "Life-Time Achievement Award" to be presented to Mr. Suhas Patil and Mrs. Jayashree Patil. Both have made outstanding contributions to enhancement of Technology and spreading the entrepreneurial spirit among Indian Communities! Award will be presented on 13th April during the Vidushi Ashwini Bhide Deshpande Concert. Here is brief information about our eminent award recipients. 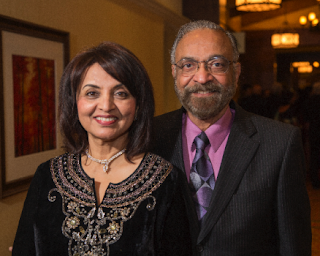 Suhas Patil is founder and Chairman Emeritus of Cirrus Logic Inc., a leading semiconductor company. Before becoming an entrepreneur, Suhas was appointed Assistant Professor of Electrical Engineering at Massachusetts Institute of Technology. At MIT, Suhas’s work has covered computer architecture, parallel processing computers, very-large-scale integration devices, and integrated circuit design automation software. He is known for describing the "cigarette smokers problem" for concurrent computing in 1971. Jayashree has dedicated her life to nurturing her large and ever-growing family and contributing to the Indian community in the Bay Area. In her household, she takes loving care of all her family and friends. She loves to cook and feed, loves to paint and write poetry. She complements Suhas by bringing colour, laughter, energy, and joy to their home. But she does just as much outside the home as within it. She has been an influential member of the South Asian community in the Bay Area. She has spent considerable time working for multiple tech startups as well as nonprofits. Jayashree volunteered as the first Executive Director of The Indus Entrepreneurs (TIE); a nonprofit which supports entrepreneurship. She also served as Founder and board member for India Community Service Center or ICC. We would like to kick off this years entertainment by a one of a kind program on 23rd Feb - Harmonium Harmony - a tribute by Harmonium Accompanist, Kedar Naphade to his Guru Tulsidas Borkar . Music students will find this program especially educational. SwarSudha and Calaa are teaming together to bring a brand new Marathi Comedy Drama, "Welcome Zindagi" to Bay Area on 21st October! This play is written by Saumya Joshi and directed by Rajan Tamhane. For the first time, you will get to watch a Veteran Actor, Dr. Girish Oak and a Versatile Actor, Bharat Jadhav in Bay Area, making you laugh as well think deeper about meaning of life! Shivani Rangole is in supporting role giving the drama unexpected twists!